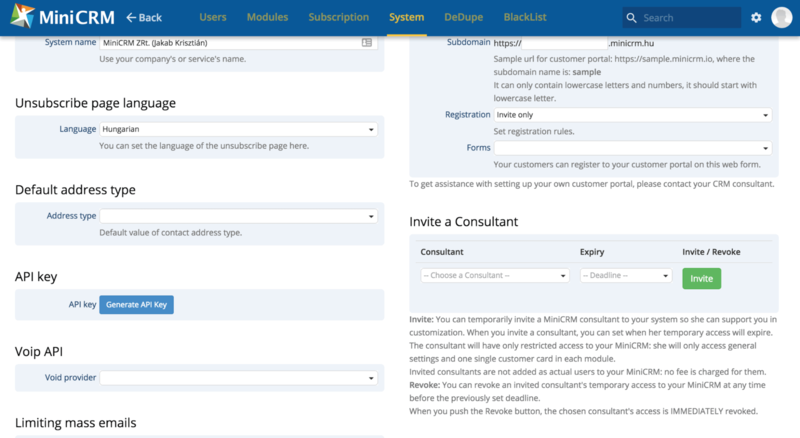 By using the Invoice API, other programs and applications will be able to use the Invoicing features of MiniCRM. The identification occurs via standard “http” protocol - HTTP Auth. The API also can be used via HTTP Secure connection, by using “https://” as the prefix. The character coding of the API is UTF-8. Every request is accepted in UTF-8 coding, and every response will be given in UTF-8. The formats of both the input and the output will be in JSON serialized arrays. The Invoice module and the Invoice API are only able to handle electronic documents (electronic invoice). By using this function, you can access the information recorded on the invoice in the system. The parameter is expecting the ID of an already existing document. The ID of the document and the ID of the project (opportunity card) connected to the document does not match! With this function, a new document can be created in the system. This function expects a similar format as the previous request, and can be accessible via POST method. The data are expected in JSON encode format. CustomerID and ReferenceID are always required! ContactId: The identification number of the contact in the address book of the system. ReferenceId: The identification number of the project (opp. card) previously created by the XML sync. The billing address will be used for the invoicing. If there is no billing address in the system, the primary address will be used. Customer Array is optional. By using it, you can record the information about the customer. If the address given here is already in the system, the system will use it. If it is not in the system, the address given here will be recorded as the billing address. The VatNumber and AccountNumber will be overwritten every time! This method changes the status of an invoice to Paid. In case of a pro-forma, it also generates a paid invoice. This function uses POST request similar to the one before. You can use more Customer arrays if any information has been changed since the pro-forma was created and you want to create the invoice with up-to-date data. You can storno a specific invoice already created in the system. This function works via POST method. If an invoice is reversed, the system automatically generates a Storno invoice. The invoice API will respond with HTTP status codes if any error occurs. If the response is 200 - OK, the request was successful. If an error occurs, the answer will not be JSON, but plain text. 400 - Bad Request: In the request sent, the parameter is not allowed, or cannot be processed. Also, this code will be the response when the API expects a parameter, but it’s not in the request. In the following Php example, we are going to use the API via the curl.